Open your eyes and bear witness to a display of athleticism unmatched even by the most elite Olympians in all of history: This man at the gym is all-out sprinting on the treadmill in cargo shorts while watching old episodes of River Monsters on a Microsoft Surface tablet. Feast your eyes because a true titan of sport like this one only comes around once every few centuries. Unlike the other gym patrons who are patiently filing into the locker room to change into their pathetic workout clothes, this man walked full-speed into this Planet Fitness and hopped up onto a treadmill in his cargo shorts without even stopping to take off his backpack. 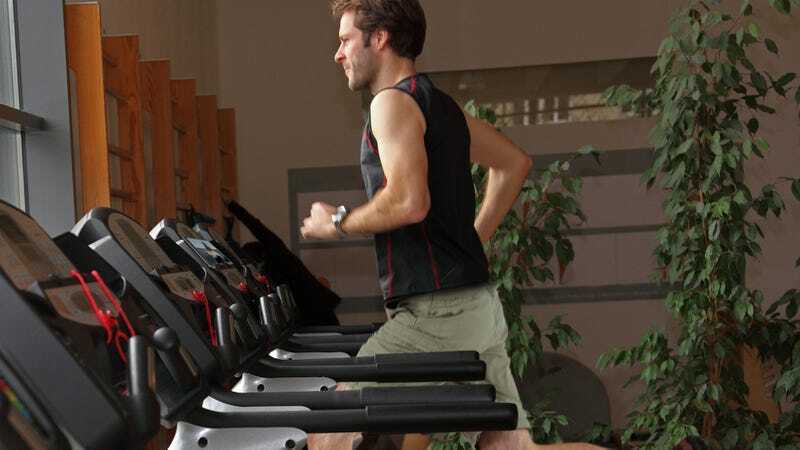 He then wasted no time turning the treadmill up to its highest, 12-mile-per-hour setting and began to run at a powerful full sprint that is making the entire machine shake with every thunderous step of his Converse-clad feet. It seems the only thing bolstering his spirit as he makes this Herculean effort is the 2010 episode of River Monsters playing on the Microsoft Surface which he is periodically turning the volume up on while he continues at his breakneck pace. Incredible. Though this man has already broken into a full-body sweat just 45 seconds into his workout, he is still managing to find the strength to periodically grunt “Hiya!” as he sprints. In an amazing show of athletic prowess, this peerless runner is stopping once a minute to smash the treadmill’s stop button with the full force of his palm and bend over to pant with his hands on his knees for a good 30 seconds—never removing the enormous over-the-ear headphones connected to the tablet blasting a River Monsters segment about catfish. The blue button-down shirt he’s wearing is now completely soaked through, but that hasn’t deterred the colossus of exercise from doing two slow burpees on the stopped treadmill, then fast-forwarding all the way to the River Monsters credits as he gradually adjusts the machine to an almost 90-degree incline. Sorry, Lebron! You might have thought you were the greatest athlete of our generation, but there’s a new king in town! Now that this incredible man has seemingly finished his 17-minute workout, he has immediately begun eating from a bag of Nacho Cheese Doritos as he cools down on the treadmill at a one-mile-per-hour pace. We could all look to him for inspiration on our quests to become fit because this man is athleticism incarnate!